Plan-Sets offered to build Bridges. 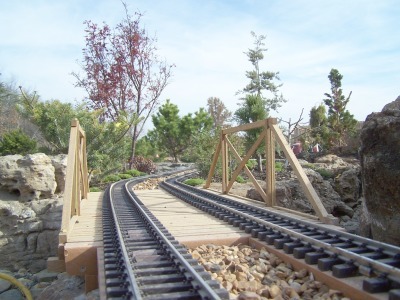 Model railroads that have a steam locomotive on its roster need a wooden bridge. 67' Timber Deck bridges built with optional pipe railings at the Taltree Arboretum & Gardens by Tom Kreiger. 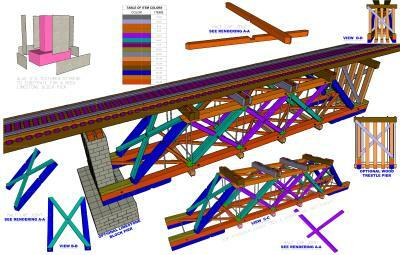 ​​Deck Bridges - Horizontal Lateral Truss work is below trackage. 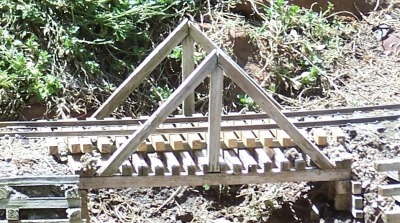 Through Bridges - Horizontal Lateral Truss work is above and below trackage. 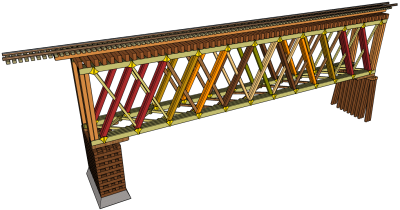 Pony Bridges - Compression Truss work only extends above trackage and are not connected. Wood was readily available throughout most of the North America Continent in the early days of railroading, thereby minimizing construction costs. The need for an arch was eliminated by the use of bridges designed solely with Trusses therefor reducing construction time. Howe Timber Box Truss Single and Double Track Deck and Through Bridges​​ •••• This prototypical bridge would have been common in the last quarter of the 19th century and if well maintained lasted well into the 20th century. Pile and stacked timber pier options are shown. Bridges as designed is 127΄ (63½ʺ) long, options include: 67΄ (33½ʺ), 77΄ (38½ʺ), 117΄ (58½ʺ), 127΄ (63½ʺ) and 147΄ (75ʺ) versions. $16 Single Track Deck Plan-Set includes: 11) 13" x 19" super B drawings. $25 Single Track Through Plan- Set includes: 18) 13" x 19" super B drawings. 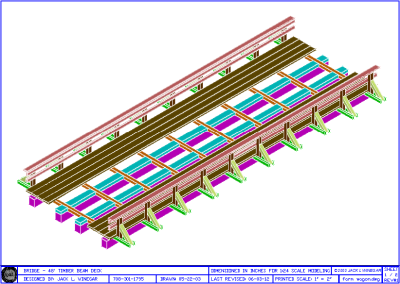 A$K Double Track Deck Plan-Set is Under Construction. $34 Double Track Through Plan-Set includes: 23) super B drawings. 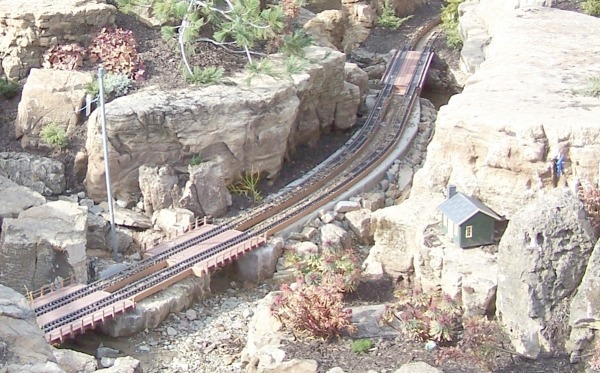 All Plan-Sets include material lists for indoor and outdoor railroad gardens. Full size templates of all truss pieces, material lists for all Bridge lengths and Diagonal Cast-Iron Socket fixture. $13 Spiral Bound Booklets consists of: 14) 9½ʺ x 13ʺ pages of acceptable garden RR materials, adhesives, painting and weathering instructions, photos and 3-D renderings. Long-Panel Timber Truss Single & Double Track Deck Bridges​​ •••• This truss design is known as a Long-Panel Truss of overlapping triangles without vertical posts. 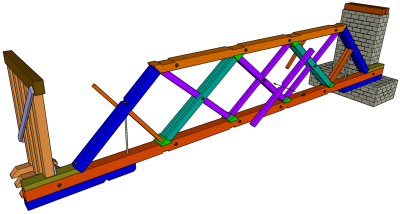 This type of truss could be used for bridges up to 150 feet long. This prototypical bridge as designed is 35" (70΄) long which can be easily changed ±6¼ʺ (±12½΄). 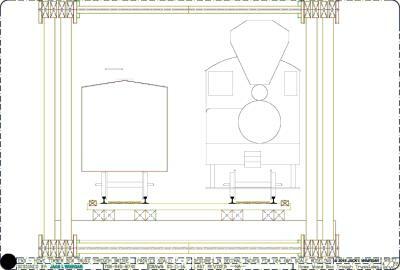 S16 Single Track Deck Plan-Set includes: 11) 13" x 19" super B drawings. $19 Double Track Deck Plan-Set includes: 12) 13" x 19" super B drawings. Both Plan-Sets include material lists for indoor and outdoor railroad gardens. 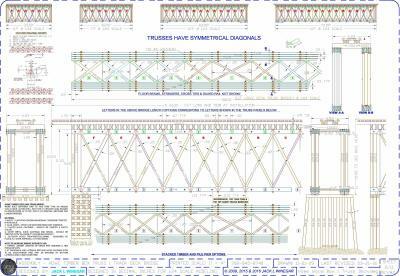 Material list of full size templates of all truss pieces. $13 Spiral Bound 1- & 2-Track Deck Booklets consists of: 18) 9½ʺ x 13ʺ pages of acceptable garden RR materials, adhesives, painting and weathering instructions, photos and 3-D renderings. $13 Spiral Bound Bridge Booklets. 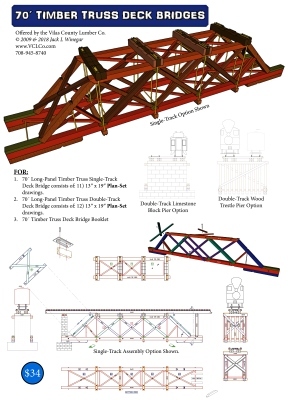 1:48 O Scale, Plan-Sets & Booklets for Howe Timber Box Truss Single Track Deck and Through Bridges​​ •••• Same Howe details of bridges described above. Bridges as designed is 127΄ (63-½ʺ) long, options include: 67΄ (16¾ʺ), 77΄ (19¼ʺ), 117΄ (29¼ʺ), 127΄ (31¾ʺ) and 147΄ (37½ʺ) versions. $12 Deck , Plan-Set includes: 7) 13" x 19" super B drawings. 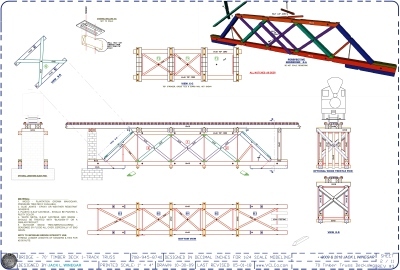 Both Plan-Sets include material lists with full size templates of all truss pieces. Both Spiral Bound Single Track Booklets consists of: 10) 9½ʺ x 13ʺ pages of acceptable material list, adhesives, painting and weathering instructions, photos, 3-D renderings and prototypical drawings. 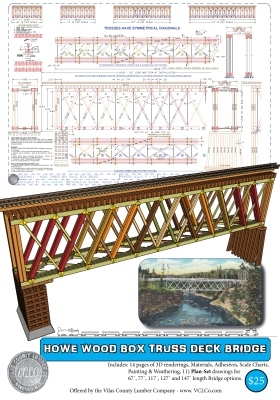 1:48 O Scale, Plan-Sets & Booklets for 70' Long-Panel Timber Truss Single and Double Track Deck Bridges​​ •••• Same details of Long Panel bridges described above. 17½ʺ long, can easily be changed ±3⅛ʺ. 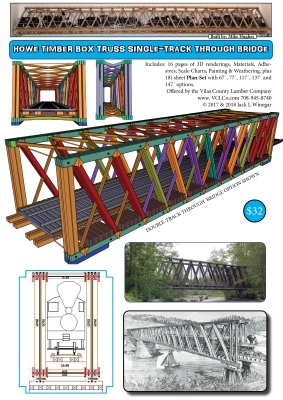 $13 Single & Double Track Deck, Plan-Set includes: 8) 13" x 19" super B drawings which includes material lists with full size templates of all truss pieces. Spiral Bound Single and Double Track Booklet consists of: 8) 9½ʺ x 13ʺ pages of acceptable material list, adhesives, painting and weathering instructions, photos, and 3-D renderings. 72΄ Queen Post Truss Pony Bridge​​ •••• A queen post is a tension member in a truss that can span longer openings than a king post truss. Designed for two tracks, obviously it can be built for a single track. 36ʺ long as designed. $10 Plan-Set , includes: 4) 13" x 19" super B drawings. 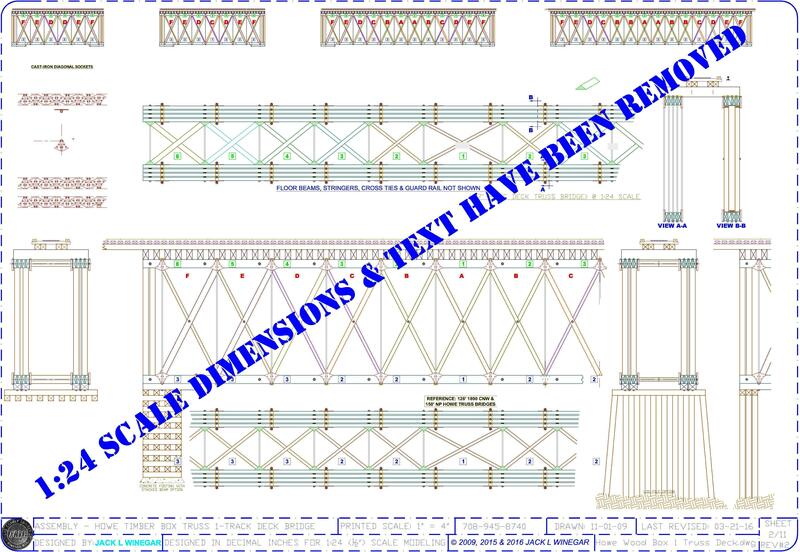 Plan-Sets include material lists with full size templates of all truss pieces. Spiral Bound Booklet , consists of: 8) 9½ʺ x 13ʺ pages of acceptable material list, adhesives, painting and weathering instructions, and photos. 50’ King Post Truss Through Bridge​​ •••• King post is the simplest of trusses used to construct short span bridges. Plan-Set is a Through bridge. As built picture distinction shows a Pony version. 25" long as designed. $11 Plan-Set , includes: 4) 13ʺ x 19ʺ super B size drawings with a material list, and full scale templates. Construct for indoor or outdoor railroad gardens. Timber Beam Double Track Deck Bridge​​ •••• Designed for two tracks, obviously it can be built for a single track. Optional wood, pipe or no railings are shown. 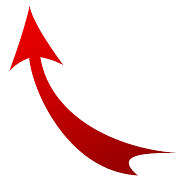 33½ʺ ±4" long by 18¼ʺ as designed. $9 Plan-Set , includes: 2) 13" x 19" super B drawings. 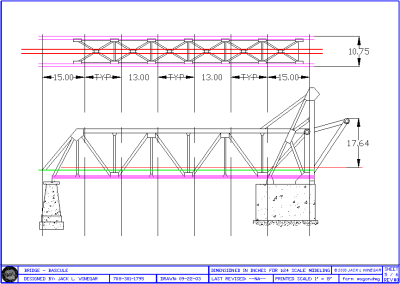 Plan-Sets include material lists with full size templates of all truss pieces. $16 Plan-Set , includes: 11) 13" x 19" super B drawings. The Plan-Set includes a Material List, turning and electrical polarity options with construction instructions. Skill levels required to build this Turntable varies. Side girder plates fastened to a block is the easiest, or use commercial styrene shapes riveted to the girder plates for the most skilled finescale modeler, with variations in-between. Full size templates are available for ease of construction. CLICK to view list of Plan-Set drawings. Spiral Bound Booklet , consists of: 20) 9½ʺ x 13ʺ pages of acceptable material list, adhesives, painting, weathering instructions, photos with 60) pictures and 6) additional prototype drawings. CLICK to view the 31 page Spiral Bound Booklet INDEX. 144' Timber Whipple Bowstring Truss Bridge​​ •••• This type of bridge was widely built during the second half of the nineteenth century, from 50 to 250 foot long. Whipple Trusses gained immediately popular with railroads as it was stronger than the Pratt Truss. 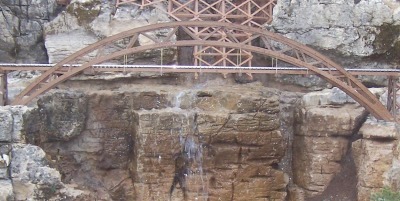 A Bowstring Truss bridge is similar in appearance to a Tied-Arch; however, the Bowstring Truss behaves as truss, not an Arch. 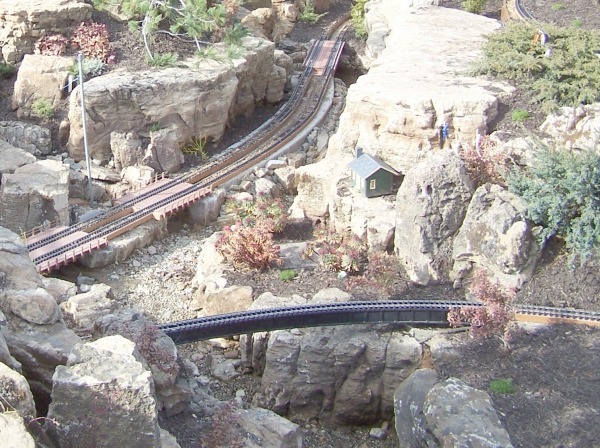 Designed for two tracks, obviously it can be built for a single track 72ʺ long bridge. 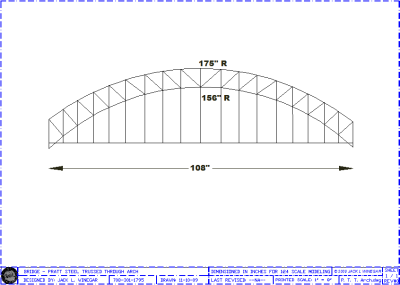 216' Wood Through Tied-Arch Bridge​​ •••• This is a great looking freelance 108ʺ long bridge that will be the “WOW” factor of everyone entering your Railroad Garden. This bridge was built with laminated Ipe wood for maximum outdoor longevity and capped with brass strips for a prototypical look along with threaded brass rod for a nice “transparency” see-through look. ​The visual distinction of a Tied-Arch bridge to a Bowstring Truss is that it does not have substantial diagonal members between members. 216' Steel Pratt Truss Through Tied-Arch Bridge​​ •••• This 108ʺ Tied-Arch / Bowstring with a Pratt Truss type is commonly used for suspension bridges. The Tied-Arch resists spreading (drift) at its bearing by using the deck as a tie place. It is claimed by many that suspension bridges were not used for trains. NOT true! I have seen documentation on two RR suspension bridges. This bridge would look good in a Railroad Garden. This bridge is being designed with styrene shapes to represent steel for indoor and outdoor Railroad Gardens. 190' Steel Bascule Bridge​​ •••• Bascule bridges were, and can still be found in many cities where trains needed to cross rivers. 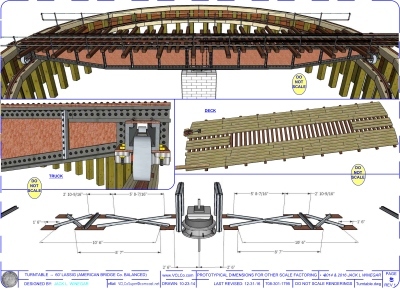 This is prototypical design of the CNW Bridge that is still located on the north branch of the Chicago River by Kinzie St.
Bascule is based on the French word meaning “see-saw,” a Bascule Bridge features a movable span which rotates on trunnion (a horizontal axis). A large concrete counterweight offsets the weight of the structure. 92΄ Timber Straining Beam Truss Pony Bridge​​ •••• This prototypical bridge is basically a multiple King Post Truss bridge with framed joints. As designed it is 92΄ long (46ʺ in 1:24 (½ʺ) scale) which the size can be easily changed ±8⅓΄ (4-3/16ʺ) designed for single track. 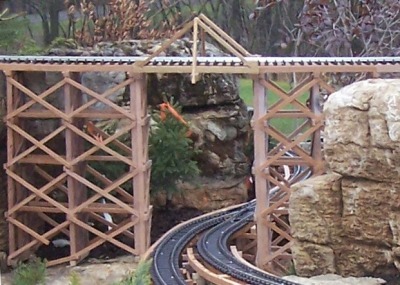 Easily constructed for a double track for indoor or outdoor Railroad Gardens.